In the recent article in Wired about OTEC, OCEES International is mentioned to not only have secured funding from “Pentagon” to build an OTEC at Diego Garcia, but also design the OTEC pipe for the Saipan project in the article. However, after asking Stephen Oney, Vice president at OCEES, he tells me that Wired overstated the situation. 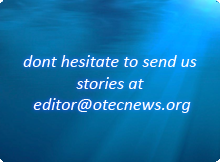 They are working on a preliminary design of an OTEC for the the Office of Naval Research. Stephen Oney also said: “If we are able to come up with an economically and technically viable project, which we feel we can, then we may begin negotiations for developing the commercial project. To date, we have no deal with the Pentagon to build a system.” Furthermore they are not doing the “pipe work” for the Saipan project.